It’s hard to escape the KFC connection when people learn of my Kentucky roots. On a trip to England, most Brits I met said they only knew two things about Kentucky: the Queen has some horses here, and it’s where Kentucky Fried Chicken comes from. Last weekend, I embraced my ties to this iconic brand and wound up in Laurel County, Ky., the birthplace of KFC, for the 21st Annual World Chicken Festival. 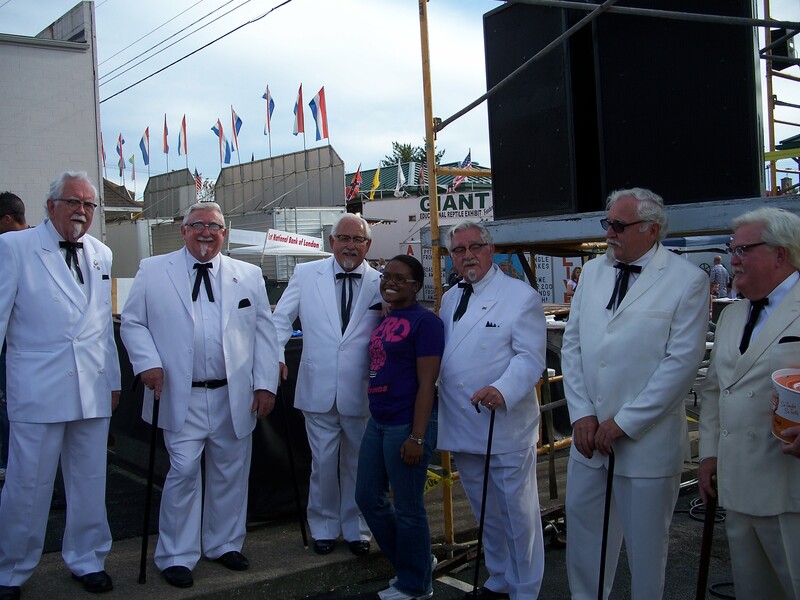 The festival celebrates Laurel County’s heritage and the area’s most famous exports – KFC and its creator, Colonel Harland Sanders, the county’s white-suit-wearing, goatee-sporting native son whose face is one of the most recognizable in the world. (Interestingly, many people don’t realize that he was a real person). I didn’t come across a lot of chicken at this celebration of poultry. But I returned to Louisville with an appreciation for the tiny diner that became a fast-food giant. Chicken Fest, which takes place in London, is a street fair full of vendors, live Bluegrass music, midway rides and, of course, chicken. 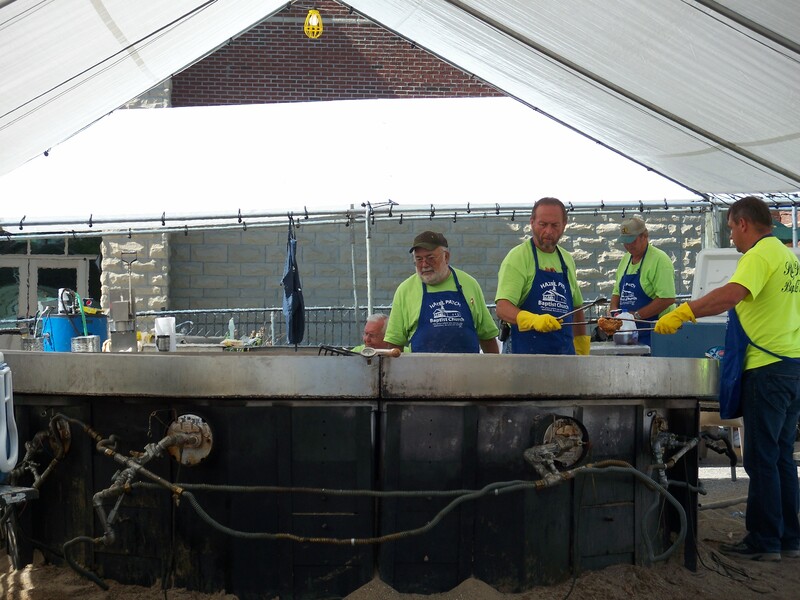 The big draw of the event was the chance to eat chicken cooked in the world’s largest skillet. But instead of being a huge cast iron skillet like I pictured, the pan was an industrial steel tub split into four sections. The world's largest frying pan. Cue the Debbie Downer music. I didn’t try any of the chicken from this record-breaking skillet on the recommendation of a friend who is from London and attends the festival each year. She compared the chicken to cafeteria food. Yikes. 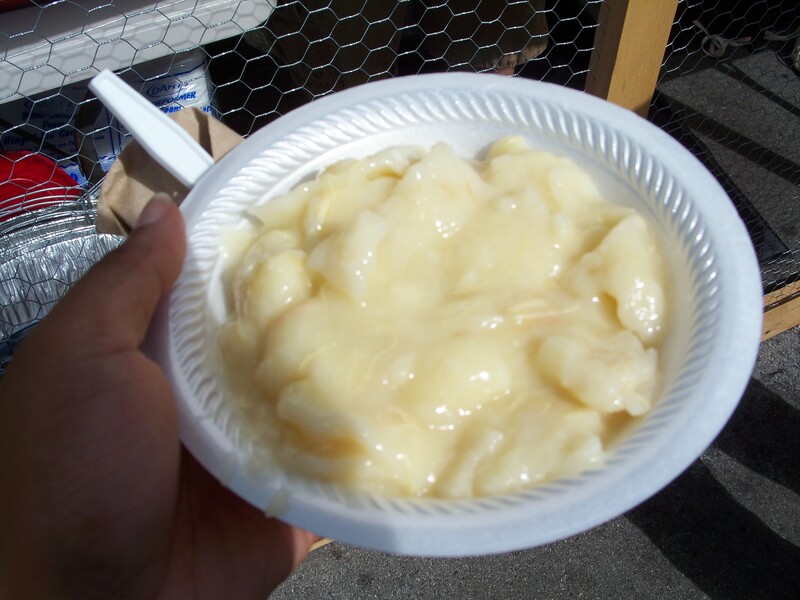 Instead, I bought a $3 bowl of chicken and dumplings. I only came across one shred of chicken meat, but the dumplings were well-flavored, thick and doughy. Lots of dough. Little chicken. But the highlight of my trip to southeastern Kentucky took place after I left Chicken Fest (and after my encounter with six Colonel Sanders lookalikes). 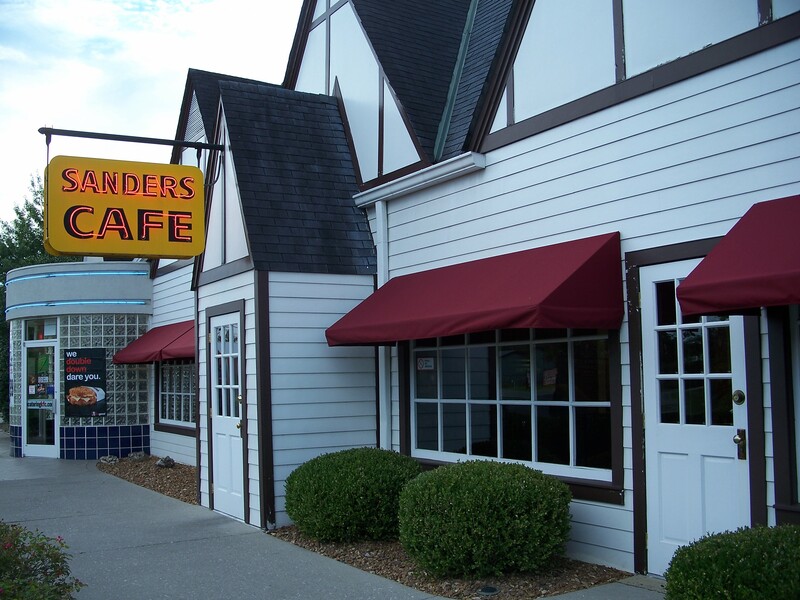 Two friends and I drove down the road to North Corbin to Sanders’ Café, the diner that was the precursor to Kentucky Fried Chicken. A view of Sanders Cafe, the original KFC. 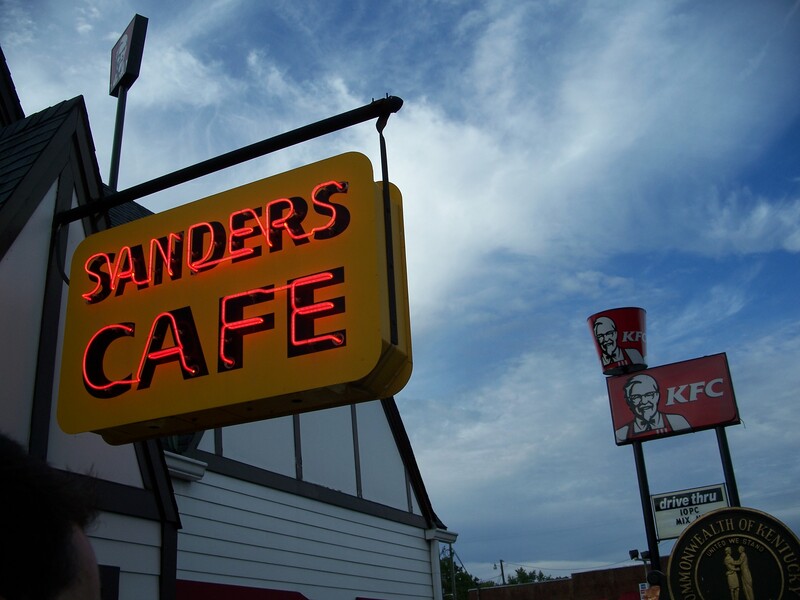 Visiting Sanders’ Café was a welcome reminder of KFC’s humble heritage as a restaurant attached to a motel. The lobby features a model of the original motel and restaurant, along with cases of memorabilia such as recipe cards, the barrels that held those 11 secret herbs and spices, and pictures of the Colonel before he became, well, the Colonel (FYI – he was a brunette). The displays taught me a lot about the man behind the brand. For example, Sanders arguably ignited the fast-food revolution by reducing the time it took to fry chicken from more than 30 minutes to just 13. And who knew he ran for state senate in 1951? The building has been restored to its 1940s luster that allows visitors to eat in the original wood-paneled dining room. There are also recreations of the Colonel’s kitchen and motel room in the dining area. But with all that history, visitors are smacked with the reality of what Kentucky Fried Chicken has become – a fast-food behemoth. 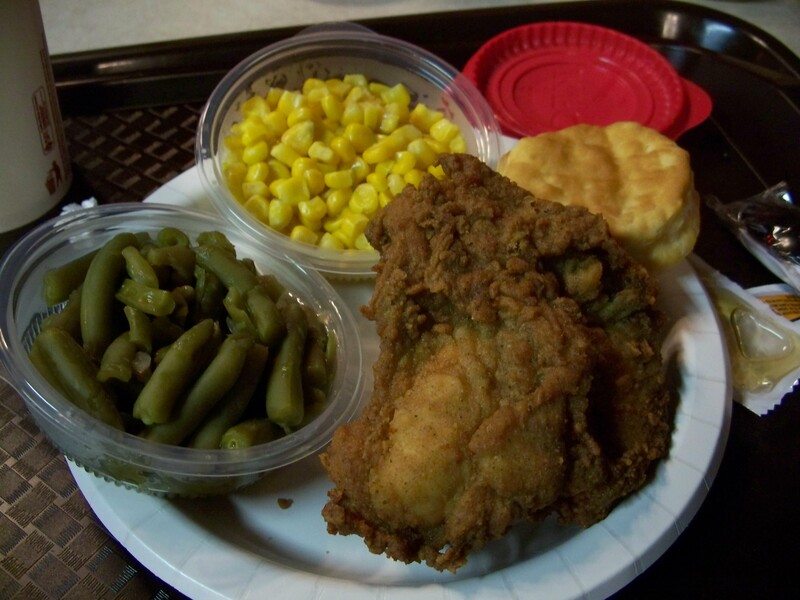 I thought the café would offer up some original-recipe chicken cooked in small batches and served diner-style. Instead, the historical building is home to the same KFC that is available worldwide. Original recipe chicken breast with green beans, corn and a biscuit. The food was tasty, but I couldn’t help but ponder how KFC catapulted from a small business to an enormous chain. Would the Colonel be happy with KFC’s current menu? Would he be happy with he comparably limited selections? Could honestly stand behind the Double Down? Despite the questions, I had a great time at Sanders’ Café. This should be a stop on every Kentucky road trip. Sure, you’ll get the same food available at your neighborhood KFC, but there are some hefty bragging rights that come with eating where it all began. who is the colonel sanders on far right of pic? looks just like me.